This page compares AESA radar vs PESA radar and mentions difference between AESA radar and PESA radar. 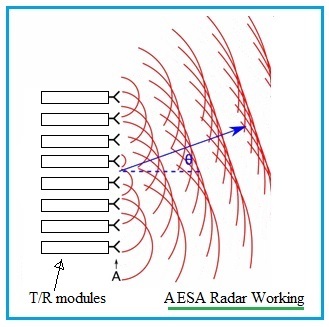 AESA stands for	Active Electronically Scanned Array	while PESA stands for Passive Electronically Scanned Array. PESA radar uses common shared RF source in which signal is modified using digitally controlled phase shifter modules. 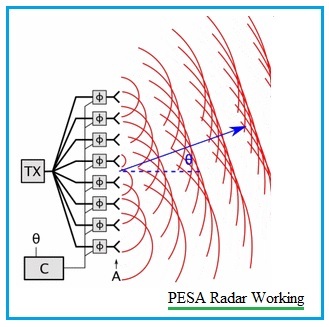 Following are the features of PESA radar. • As shown in the figure-1, it uses single transmitter/receiver module. • PESA radar produces beam of radio waves which can be electronically steered in different directions. • Here antenna elements are interfaced with single transmitter/receiver. Here PESA differs from AESA where separate transmit/receive modules are used for each of the antenna elements. All these are controlled by computer as mentioned below. • Due to single frequency of use, it has high probability to be jammed by enemy RF jammers. • It has slow scan rate and can track only single target or handle single task at a time. As mentioned, AESA uses electronically controlled array antenna in which beam of radio waves can be electronically steered in order to point the same in different directions without movement of the antenna. It is considered to be advanced version of PESA radar. AESA uses many individual and small transmit/receive (TRx) modules. Following are the features of AESA radar. • As shown in the figure-2, it uses multiple transmitter/receiver modules. • The multiple Transmit/Receive modules are interfaced with multiple antenna elements known as array antenna. • AESA radar produces multiple beams at different radio frequencies simultaneously. • Due to capabilities of multiple frequency generation over wide range, it has least probability to be jammed by enemy RF jammers. • It has fast scan rates and can track multiple targets or multiple tasks. Refer AESA Radar block diagram for more information. Following are the similarities between modern PESA and AESA radar types. • Both modern PESA and AESA are generally pulse radars. • Both modern PESA and AESA are frequency agile and frequency hopped at different frequencies at different times. • Both can have narrow band and wide band modes. • Both can be used for ECM, passive scanning, beamforming etc.